Thousands of strawberries flood into the Florida Strawberry Festival each year. The berries are picked fresh each day and are the foundation for the beloved event. The Florida Strawberry Festival draws approximately 500,000 visitors each year. Everywhere guests turn there are strawberry shortcakes, strawberry-themed contests and rides and even two local strawberry farms selling the freshly picked fruit to the public. Parkesdale Farms sends approximately 15,000 to 20,000 half flats and full flats of berries to the festival. They also sell quart cups at the 11-day event. When customers pick up Parkesdale produce they can be assured they are getting fresh product. Workers pick the strawberries fresh each morning before Matt Parke delivers them to the festival. morning around 7 a.m. before sending them straight on to the festival. Any berries that aren’t sold by that evening have their tops removed and are used in the Parkesdale Market’s strawberry shortcake. Each berry residing at the large booth was picked straight from the plant that morning. Roy Parke was instrumental in building the festival to its current glory. As one of the pioneers of the strawberry industry, he put his heart and soul into building the festival. 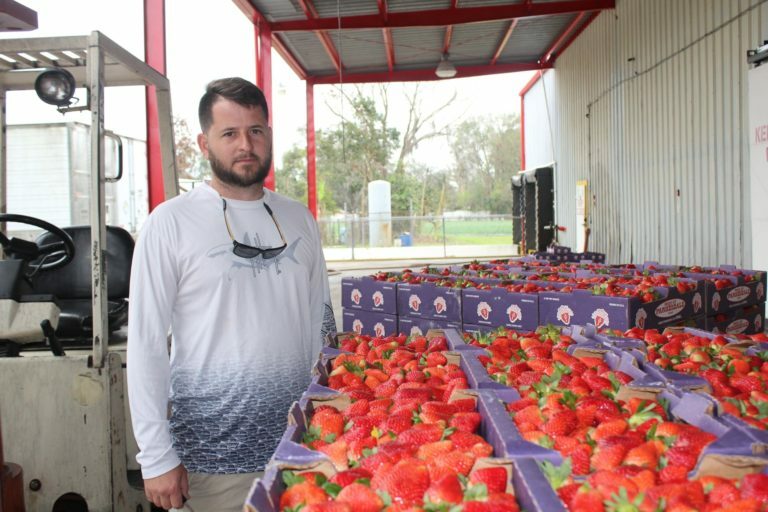 Known as the “Strawberry King,” he served as festival president for two years, has a building on the festival grounds named in his honor and was the first person inducted into the Florida Strawberry Growers Hall of Fame. Ask anyone in town and they’ll all say the same thing: The festival was Roy Parke’s passion. Today, after decades in the festival, the Parkesdale booth sees thousands of visitors. The sales booth line is shoulder-to-shoulder as attendees rush to take home the famous berries. Surprisingly, Parkesdale Farms doesn’t feature its iconic shortcake at the festival, a move apparently orchestrated by Roy Parke years ago. He was instrumental in implementing the rule that only nonprofits could sell the crowd favorite at the festival. However, Matt Parke said the family is considering bringing their strawberry milkshakes to the event soon. The booth itself has become an iconic place to visit. This year, visitors may be surprised to find the stall has a new look. The white and red shimmering stall is no more. In its place is a traditional country barn. The wood paneling and farm atmosphere will still feature the strawberry throne and sell the fresh berries as well as strawberry cookies and strawberry jams and preserves. The family’s market is also experiencing a rush as the festival draws near. Matt Parke said starting around Feb. 1 there is a nonstop line all day at the market regardless of rain, heat or cold as people wait through the elements for that coveted strawberry shortcake or shake. The entire family seems to share the passion started all those decades ago by Roy Parke. Bobby Parke, now retired, grows “strawberry onions,” which are sold at the market. Peggy Parke, vice president of Parkesdale Farms, has been active in the festival for the past 45 years. She started when she was 20 and now runs the booth and spearheads its design and activities each year. She said without the Parkesdale booth, there would be something missing from the festival. In fact, Matt Parke’s 92 year old grandmother still works at the booth every day of the festival.